David Lamoureux sees liquidity as ‘more and more important’ for mature systems like CalSTRS. For the 14 public teacher retirement systems in Pensions & Investments' universe of the 200 largest U.S. retirement plans, the relatively good news is that the growth rate in the gap between contributions made to the pension plans and benefits paid to participants appears to be slowing. While the gap has grown at a compound annual rate of 3.1% since 2008, growth over the past five years has been just 1%, according to data submitted for the most recent plan year. Teacher pension fund officials in particular will have to pay attention to mortality tables. Teachers represent the largest public pension obligations compared with other public-sector job categories, according to the first comprehensive look at mortality tables for public-sector pension plans released Jan. 22 by the Society of Actuaries. Teachers have the longest age-65 life expectancy, and higher rates of deferring pensions to at least age 62 compared with public safety and general employee categories. Female teachers reaching age 65 had life expectancies of 90.03, compared with 87.7 for male teachers. Mortality tables are just one of many assumptions used to calculate pension funding, and plan sponsors can choose how and when to incorporate the new tables into their plan valuations. Updating assumptions can have an impact on liabilities, which in turn could change funding requirements, but those outcomes are plan specific. The $229.2 billion defined benefit plan of the California State Teachers' Retirement System, West Sacramento, saw its cash-flow gap grow to $3.5 billion by the end of 2017 from $997 million in 2008, despite combined employer-employee contributions increasing to $10.1 billion from $6.6 billion over the same period, according to data from Publicplansdata.org. The gap began to change in 2014, when Gov. Jerry Brown and pension fund stakeholders agreed to contribute more, and they are ramping up to be fully funded by 2046. The changes also gave the board some rate-setting authority so it can adjust contribution rates if needed. Without those changes, assets would have dwindled to zero. "We were on a path toward using every dollar in the fund," said CalSTRS systems actuary David Lamoureux. Now, he said, "we're heading up." CalSTRS reported a funding ratio of 62.6% on a smoothed actuarial basis as of June 30, 2017, down from 63.7%. The decrease was due to the fund's lowering its long-term investment return assumption to 7% from 7.25%. Negative cash flow "isn't a sign of anything wrong with the plan" necessarily, said Jean-Pierre Aubry, associate director of state and local research at the Center for Retirement Research at Boston College. While it is something to monitor, it could present other potential issues for some plans, including whether they might need to start selling assets if contributions aren't enough, he said. "It changes how asset managers think about things, and maybe holding things that aren't illiquid when you have larger calls coming due," said Mr. Aubry. Mr. Lamoureux of CalSTRS agrees that negative cash flow "is kind of the natural state" for a mature system. "We have been telling the board the last three years that there is no reason to panic. We have reached a point where we will always pay more than we collect. We want to make sure we don't have to sell assets. We want to make sure we invest in types of assets that generate cash. Liquidity is becoming more and more important," he said. The $55.1 billion Pennsylvania Public School Employees' Retirement System, Harrisburg, has a 20-plus year plan to close its funding gap and reverse 15 years of unaddressed pension debt. Along with good investment performance and growth in active participants, significantly higher employer contribution rates — including 34.29% in fiscal year 2020 — are a big part of that plan. After 15 years of the Legislature not paying the bills, "we are on the right path now," said spokeswoman Evelyn Williams, who added that recent reforms changing to a hybrid system for new employees also should help. 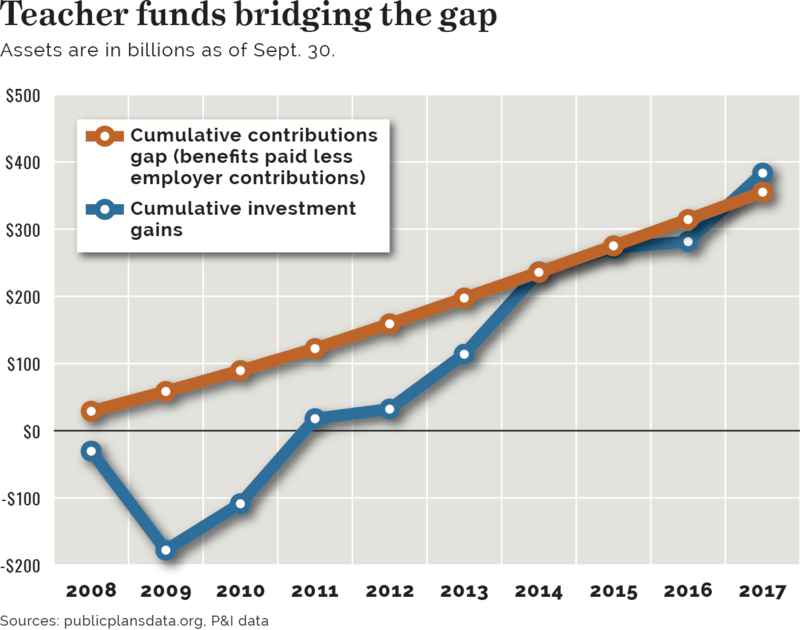 With large employer contribution rate increases hopefully now in the past, the Public School Employees fund is also enjoying the end of its 10-year asset smoothing cycle, shedding the last vestiges of the recession, and has tamed volatility through asset allocation changes made after 2008, including reduced exposure to equities. "We were really looking for classes that react differently in a down market," Ms. Williams said. An actuarial funded ratio of 56.5% as of June 30, 2018, represented the second year of improvement, and future ratios are projected to rise, she said. Investment gains that took some time to recover from the drop during the financial crisis are now helping to fill the cash-flow gap, but the volatility is not going away. For the $10.96 billion Public School Teachers' Pension & Retirement Fund of Chicago, a 10-year dry spell with no asset growth thanks to increased benefit payments caused it to lose its long-standing place in P&I's top 200 ranking in 2018. Ten years ago, the plan ranked 113th on P&I's list with $10.3 billion in assets as of Sept. 30, 2008. For the $77.6 billion defined benefit plan of the Ohio State Teachers' Retirement System, Columbus, the gap between $3.2 billion in total contributions, including $1.6 billion from employers, and more than $7 billion in payments in fiscal 2018 "must be made up through investment returns," spokesman Nick Treneff said. Pension fund officials also made the "difficult but necessary decision" to eliminate a cost-of-living adjustment and lower the fund's investment return assumption to 7.45%, following a fiscal 2017 asset-liability study and a five-year experience review that led to changes in some actuarial assumptions, including new generational mortality tables showing that members are living longer. "If the system meets its actuarial assumptions — which admittedly can be challenging in the current market environment — the funding level will improve. It's important to have realistic actuarial assumptions," said Mr. Treneff. In a follow-up email, Mr. Treneff said that Ohio Teachers' actuary projects the fund's "negative cash flow has stabilized and should continue to decline in the near future. The 'gap' still exists, but it isn't expected to continue to grow. That's because contributions continue to increase as teacher salaries continue to grow – and pension payments have begun to stabilize as teachers work longer and the COLA remains at 0% for now." The plan's funded ratio has been steadily increasing since 2013 and now stands at 75.5%, he said.